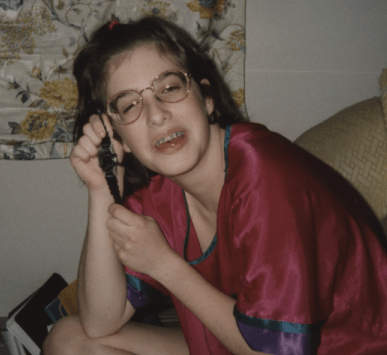 Me with my Indiglo watch, on my 14th birthday in the spring of 1995. 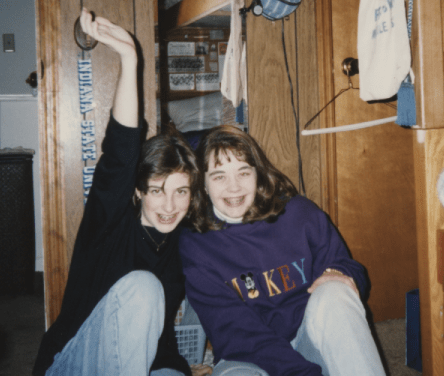 In 1995, I was a 14-year-old underdeveloped eighth-grader, overly excited about boys and unmotivated by actual spirituality. Two years away from having a license or car, I hadn’t yet begun my Winn Dixie job as a grocery bagger. My world was limited to school and church, the two places where I did all of my socializing and growing. I easily walked the half-mile from our apartment to First Baptist Church, where my mother made certain that we attended both Wednesday and Sunday services. We had no Internet. Our phone was plugged into the wall just like my grandmother’s, and you had to stay at home to receive calls. I had an Apple II GS my brother and mother purchased for me in third grade, (which, by the way, turned out to the best investment in my education). The famous wood paneled room and bunk beds, complete with Sarah, one of my best friends. Listening to music meant sitting on my bottom twin bunk bed, in my wood paneled room, blaring mix tapes and SWV CDs on a boom box I could barely lift. Cable TV was 30 or 40 channels—back when MTV played music videos and The Real World was interesting. There was no deluge of work-related email dragging everyone down, and time moved slowly and with purpose. This was back when folks had the time to go to church. Growing up in rural North Carolina, my Baptist mother made certain that “The Lord’s Day” was the hub from which life radiated. We spent nearly all Sunday at church, save for a lunch out and the bored-to-death stillness of a Sunday mid-afternoon. 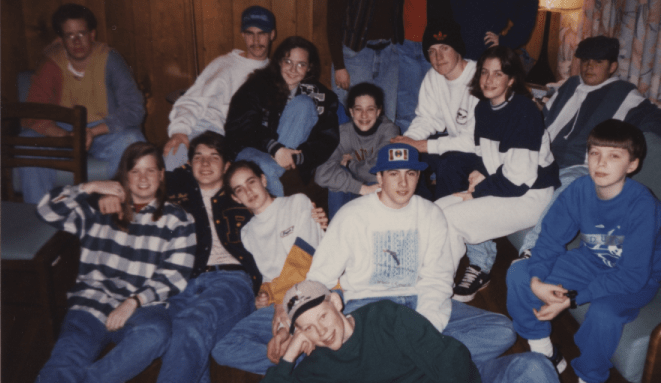 First Baptist Church Youth Group on our winter ski retreat 1995. Sundays meant sweet reunions with friends whom I didn’t attend school with during the week. We’d gossip in the church balcony, scribbling M.A.S.H. games on worship bulletins until our mothers, who were in the choir, gave us a strict talking to. On Sunday evenings, when our Youth Choir and Youth Group met, I was spiritually formed without knowing it by pastors who invested time and energy into our budding faith journeys. But, I mostly relished the icing on the faith cake: the handsome young men who attended Youth Group. Afterward, I balanced my raging hormones with sacred vespers in the old chapel, singing shoulder-to-shoulder with my mother and the blue hairs, cherished octogenarians who belted out old-fashioned Jesus hymns. My mother had learned the Sunday habit from her mother, a staunch Baptist who wouldn’t let her children play cards, go to the movies, or dance on the side porch during the 24-hour sabbath. In my mother’s day, stores weren’t open, wives made lunches at home, and children exhausted their patience waiting for something interesting to happen. 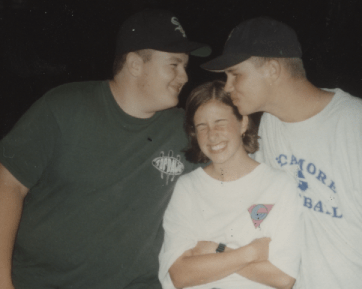 Even in my adolescence, there seemed to be more room for God. Our phones didn’t travel with us, and big-box 24-7 shopping centers were still confined to urban areas. Sleepy NC towns like mine were left to their own devices, adhering to ancient Blue Laws and limited Sunday hours. Churches were the only establishments truly “open for business,” and nearly every Reidsville resident was identified by where he or she attended services. Rodney, me, and Jerry in Dana, IN. I was boy crazy, even in 1995! Two decades later, the church attendance of my generation is in steady decline. Many factors are attributed to this shift, including the seeming abundance of time for God we felt in the 90s that has evaporated. Rest and worship have been squeezed out by workplace expectations, catch-up time, hipster brunches, and social media. I am most guilty: I hijack my own time, allowing technology, work, and distractions to chip away at my worship and spiritual time. Another week has passed, and I have not remembered the sabbath and kept it holy. Lent is the Church’s annual wilderness trek, modeled after Jesus’ aesthetic preparation for his three-year ministry. It’s when Christian faith communities around the world stop and remember that “all are from dust, and all turn to dust again” and, in solidarity with Jesus, do something spirit-nourishing. This Lent, because Fred and I love to torture ourselves with religious adventures, we’re embarking together on a sabbath experiment. We are turning back the clock 20 years. We are going to worship and rest like it’s 1995. We will worship. Fred and I will attend worship at our Baptist Church and/or our Hindu Temple each Sunday. No Internet. The Internet was not abundant in the rural South of the mid-90s. This means no Internet videos, TV, email, and social media. Mobile phones are no longer mobile. Cell phones must be used at home, plugged-into-the-wall-style, and we will only use them to talk to someone (gasp!). Computers are for writing. Computers did exist in the mainstream in 1995, but limited to Word Processor functions and games. Our laptops will only be used for these functions, including recording our experiences. Caveat: we must act as if they are desktop computers, and use them in a stationary desk. We shalt not shop. There are a million reasons why taking the sabbath off from consumerist behavior is a good idea (remember how Jesus felt about the moneychangers in the temple?). Approved sabbath activities: worship, quiet time, reading, walking, observing nature, cooking meals for ourselves and friends, organizing photos and scrapbooks, cleaning out drawers with clearing out the stuff we don’t need (and giving it away! ), chores done with mindfulness, writing letters and cards, napping (! ), museum-going, game-playing, and making phone calls to family and friends. Lent is a time to re-prioritize. It’s the church’s call to remember Jesus’ journey to the cross. It’s a time of simplicity and sacrifice. It’s a time to return to God. This experiment will likely go one of two ways: Fred and I may lean into this Lent with pleasure, relishing the “stop-day” that honors the fourth commandment. Or, we may end up killing one another, suffering from social media withdrawal. Either way, I’m certain it will be a spiritual experience. Join us for the ride—and tell us about your Lenten practice, too. What have you chosen to add on/take away this season? Stay tuned for weekly sabbath updates, and embarrassing 1995 photos I plan to drag out for your viewing pleasure. Ha! I love this! 🙂 Fred asked me about this inside joke. He loved it, too! Thanks for joining us in this intention; please let us know how your adventure goes!